"Tenth Fleet" redirects here. For other uses, see Tenth Fleet (disambiguation). Serving as the numbered fleet for U.S. Fleet Cyber Command and exercise operational control over U.S. Fleet Cyber Command-assigned forces. Directing and delivering desired tactical and operational effects in and through cyberspace, space and the electromagnetic spectrum to Navy commanders worldwide and ensure successful execution of U.S. Fleet Cyber Command-assigned mission areas. U.S. Tenth Fleet has operational control over Navy information, computer, cryptologic, and space forces. U.S. Tenth Fleet standing forces are organized into Task forces and task groups. U.S. Navy usage routinely emphasizes the Commander of the Task Force, thus CTF (and CTG) rather than TF. CTF 1010 - Naval Network Warfare Command (NNWC), "NETWARCOM"
For a period from 2010 U.S. Tenth Fleet's task forces used the Task Force 100 - Task Force 109 designation series. As soon as the United States officially declared war on Nazi Germany in late 1941, an urgent need developed to consolidate and coordinate anti-submarine operations. Although allied ship traffic had been subject to German U-boat attacks since the hostilities in Europe began, Germany began aggressively attacking American targets after the U.S. officially entered the war. U.S. Tenth Fleet was established on May 20, 1943 based on a recommendations Fleet Admiral Ernest King made to the Joint Chiefs of Staff in a memo entitled “Anti-submarine Operations.” The memo proposed a central organization with access to all intelligence about German U-Boats and the authority to direct Navy ships to prosecute them. Tenth Fleet became a clearing house for everything involving anti-submarine warfare (ASW) and had unrestricted access to the Admiralty’s U-Boat tracking room and its various ASW research and intelligence agencies.. All Allied countries coordinated ASW activities through U.S. Tenth Fleet. In addition to the coordination and supervision of all anti-submarine warfare training, anti-submarine intelligence, and coordination with the allied nations, U.S. Tenth Fleet's mission included the destruction of enemy submarines, the protection of coastal merchant shipping, and the centralization of control and routing of convoys. U.S. Tenth Fleet was composed of five primary sections: Operations, Anti-submarine Measures, Convoy and Routing, the Civilian Scientific Council, and the Air Anti-submarine Development Unit. Commander in Chief and Chief of Naval Operations Admiral Ernest King was the fleet's commander, with Rear Admiral Francis S. Low, King's assistant chief of staff for ASW, as fleet chief of staff. Admiral Low was later relieved by Rear Admiral Allan Rockwell McCann, who remained in command of U.S. Tenth Fleet until it was deactivated. U.S. Tenth Fleet never put to sea, had no ships, and never had more than about 50 people in its organization. The fleet was disbanded June 1945. after the surrender of Germany. 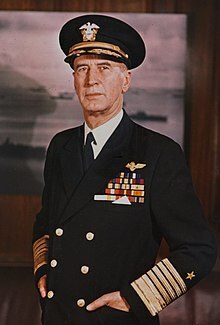 The Operations section headed by Captain Haines, was formed from the original Atlantic section of the Commander in Chief's Combat Intelligence Division, led by Commander Kenneth Knowles, whose intelligence was instrumental in U.S. Tenth Fleet’s prosecution of the U-Boat threat. This section utilized information from all the other sections combined with all source intelligence to guide the operations of so-called "hunter-killer groups" tasked with finding and destroying German U-Boats. Sources included intercepted German communications provided by OP-20-G, the precursor organization to Naval Security Group, and interrogations of captured U-Boat crews provided by OP- 16-Z, Naval Intelligence’s Special Activities Branch. The Anti-submarine Measures section, led by Captain Fitz, was divided into Air and Surface sections. This branch was responsible for the correlation of ASW research, materiel development, and training. In June of 1943, they began publishing a monthly U.S. Fleet Anti-submarine Bulletin, which came to be known as the “Yellow Peril”. The Yellow Peril discussed the latest in ASW training, new technological developments, dissected previous months U-Boat battles, among other bits of data. Each issue exceeded fifty pages. Due to its comprehensiveness and reliability, demand for the Yellow Peril was extremely high, even among the Allies. The Convoy and Routing section, chaired by Rear Admiral Martin Metcalf, was responsible for tracking the U.S. portion of convoys and planning routes they would take across the Atlantic. Known as C&R, its WAVES maintained massive wall charts detailing all ongoing convoy operations in the Atlantic. Intelligence received by the Operations Branch, once sanitized, was also added to these charts. Chief of Naval Operations (CNO) Adm. Gary Roughead salutes Vice Adm. Barry McCullough, commander of U.S. Fleet Cyber Command and U.S. 10th Fleet at the commissioning ceremony for U.S. Fleet Cyber Command Jan. 29, 2010. U.S. Tenth Fleet was recommissioned 29 January 2010 as the numbered fleet if U.S. Fleet Cyber Command with operational control over U.S. Fleet Cyber Command-assigned forces. Its first commander was Vice Admiral Bernard J. McCullough III. The fleet was re-established using existing Naval Network Warfare Command infrastructure, communications support and personnel at Fort Meade, Maryland. Much as U.S. Tenth Fleet was originally constituted to confront the U-Boat threat and ensure access to the shipping lanes of the Atlantic, U.S. Fleet Cyber Command and the modern U.S. Tenth Fleet was created to manage threats in cyber space and ensure access to online traffic and commerce. In August, 2017, President Donald Trump announced that he would elevate U.S. Cyber Command, the parent command to U.S. Fleet Cyber Command to full combatant command status. ^ Affairs, This story was written by Fleet Cyber Command/10 Fleet Public. "Navy Stands Up Fleet Cyber Command, Reestablishes U.S. 10th Fleet". Retrieved 26 May 2018. ^ "Pages - Mission & Vision". www.public.navy.mil. Retrieved 26 May 2018. ^ "USNA Navy Information Dominance Corps Overview" (PDF). U.S. Navy. Retrieved 9 November 2013. ^ "NIOC San Diego". Archived from the original on 5 August 2014. Retrieved 28 August 2014. ^ "NIOC Maryland holds Change of Command, Becomes CWG-6". U.S. Navy. Retrieved 13 October 2017. ^ "Pages - U.S. Tenth Fleet History". www.public.navy.mil. Retrieved 2 June 2018. ^ Cheryl K. Chumley (4 April 2014). "Vice Adm. Jan Tighe takes over as 'first female commander of a numbered fleet'". The Washington Times. Retrieved 27 May 2016. ^ Petty, Dan. "Navy.mil Leadership Biographies". www.navy.mil. Retrieved 16 November 2016. David Kohnen, Commanders Winn and Knowles: Winning the U-boat War with Intelligence (Enigma Press, 1999). David Kohnen, “Tombstone of Victory: Tracking the U-505 From German Commerce Raider to American War Memorial, 1944–1954” in The Journal of America’s Military Past (Winter, 2007). David Kohnen, “F-21 and F-211: A Fresh Look into the Secret Room” in Randy C. Bolano and Craig L. Symonds, ed., New Interpretations in Naval History: Selected Papers from the Fourteenth Naval History Symposium (Naval Institute Press, 2001). This page was last edited on 5 April 2019, at 19:36 (UTC).